This program is a commission based program. 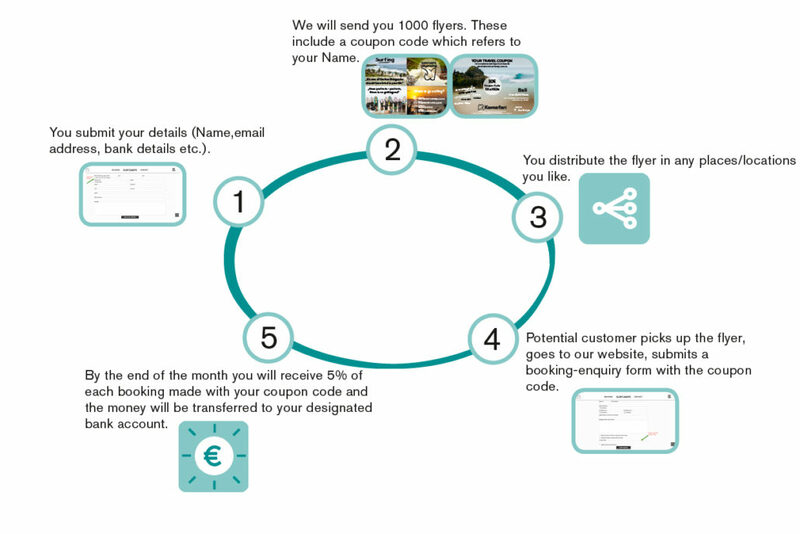 You will receive flyers from us which contain a coupon code. That code will be connected to your name and details. You can distribute Flyers wherever you like. If a potential customer submits the booking form with your code and books, you will receive 5% kickback on the Booking amount. Currently, our average booking order is around 500 Euros. Our booking enquiries convert to a booking on a 80% rate. You will receive 5% of each booking made with your coupon code.
! Currently, our average booking order is around 500 Euros ! How does the Flyer look like? How many flyers do I get? Can I order more flyers? Once your Flyers are finished, just send us an email to order more. We will send you then new flyers with your coupon code. It will depend on how smart you put the flyers in different locations. Each booking made with your coupon code, will make you 5% of the booking amount. How do you know that a code used came from me? If you join this program, you need to submit your contact details. We connect a code with your details. 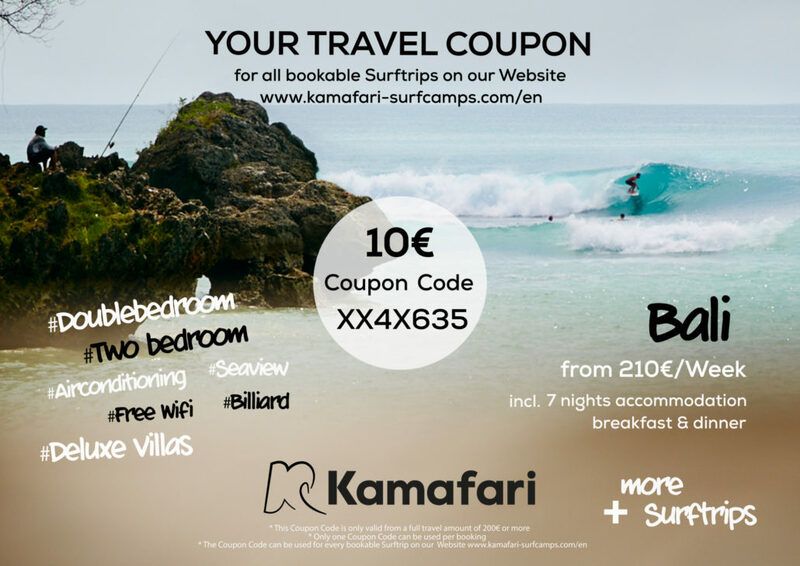 If someone is booking with your code, we will know that your Flyer was used to book with Kamafari. For your work and effort you will receive 5% of the booking amount. How do I know that my monthly commission is correct? Everytime someone using your Code on a booking, we will let you know by Email. This email contains name, booking amount and your 5% cut. At the end of every month, you will receive a list of all bookings made with your coupon code. The total commission 5% of each month will be directly transfered to your Bank Account. The Flyer Program is based on trust… trust should be the main point of every partnership. Cheating doesn’t help anyone, it only destroys relations. Choose wisely where you distribute your flyers, from our experience 10 flyers per location is enough. From our experience places/locations which you least expect, that offer the highest potential customer. High potential customers are not only people surfed before, more potential customers didn’t surf before. Most of the people just want to try it. So try to reach people which are age 18 – 40 years old. Any kind of personality, country and education books with us. We usually collect feedback and experiences from other partners to increase coupon code usage and will send you emails with tips and tricks. Either you want to fill up your travel budget, earn easy money while going out to the city or just put flyers in your high frequency location. 50€ + 19% VAT to list a Surfcamp with your own name, links to your own website and links to your social web accounts. 5€ + 19% VAT for every booking request made trough our website. 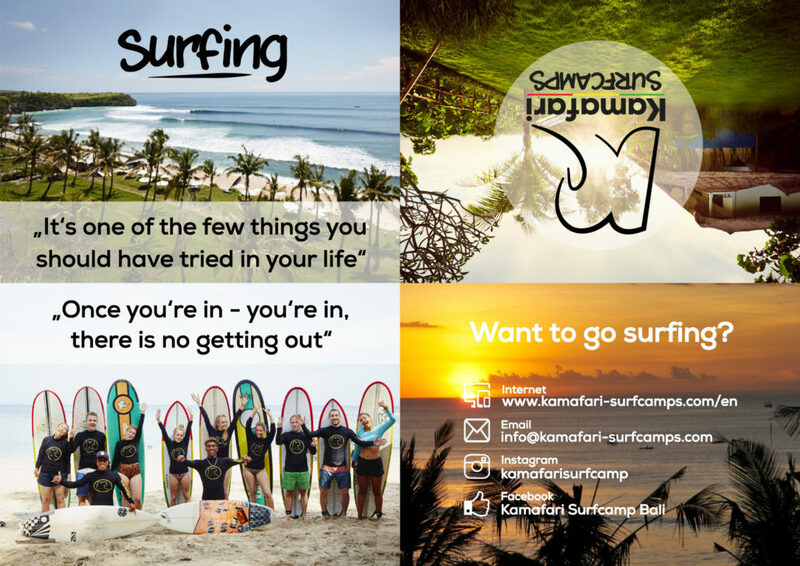 We own and do a Surfcamp since 7 years on Bali / Indonesia, so we have a lot of experience in the booking process and customer contact of a Surfcamp. The Balicamp are booking more than 400 guests every year. Our website is clicked more than 1000 times per month. Since many of our customers asking us for more and other destinations to surf, we want to offer worldwide trusted Partnercamps we have selected for them. 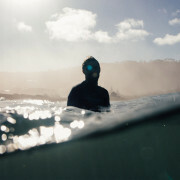 With our own Surfcamp, we also work with standard travel agencies. We know how complicated sometimes mails trough a third, expensive commission paid person are. So our Partner Program offers you the possibility to promote your Surfcamp with your name and to get booking request directly to you. The 50€ +19% VAT monthly service fees are always for a complete and before the beginning of a new service period of 12 month invoiced. The invoice can either be paid via SEPA to our German bank account or via PayPal, Credit card, Debit card online. Your cancellation terms will count on a binding booking with you. A travel contract is made with you and your customer. A long and trusted partnership is very important for us. What if our prices, pictures, infos change? We will do all modifications on your profile for free. We will ask you every year, if for new season your Camp profile needs some changes. Of course, changes and modifications can also be made anytime. It would be awesome to work with you. Let’s send people somewhere having an awesome time with surfing.